Novice Instructors training from QTS (Uk) Ltd. in Morley, Leeds. The candidate(s) must have an operator’s certificate from an accredited training company and have been using the forklift truck continuously for the past 12 months, and must have attended a refresher course within the last 6 months. The Instructor can then train and test on pieces of equipment for which they themselves have an operator’s licence. 1. A copy of the operator’s certificate of training achievement must be sent to QTS prior to attending the Instructor Course . The certificate must have been issued by an Accredited Training Company and confirm that they have attended a refresher course within the last 6 months. 2. Candidates attending the course must also have the desire to teach. 1. Health and Safety at Work. Elements 1–3 are a 55 Multi-Choice question paper and 5 open questions. A 100% pass mark is required on all theory tests. Element 4 requires you to pass an operators test with no more than 25 points. Element 5 requires you to demonstrate your ability to conduct a classroom lesson on a theoretical subject related to lift trucks, i.e. Rated Capacity, Stability, Health & Safety at Work Act etc. This is to assess your basic instructional techniques i.e. the use of visual aids, question and answer techniques, use of overhead transparencies, writing of lesson plans, aims and objectives and classroom techniques. You can provide your own transparencies for the lessons or you can use some provided by the tutor. You are to assume that you are carrying out a five-day novice operator course. At the end of each lesson a critique will be given and any constructive points discussed and recorded on the course documentation. ELEMENT 6 requires you to carry out a demonstration on a lesson of the tutors choice related to practical lift truck operation, i.e. Figure of eight, ninety degree turns, stacking at high level etc. This is to assess you demonstrating a manoeuvre without any errors, explaining the demo, student participation, confirmation techniques and basic instructional techniques. You are to assume that you are carrying out a five-day novice operator course. At the end of each lesson a critique will be given and any constructive points discussed and recorded on the course documentation. 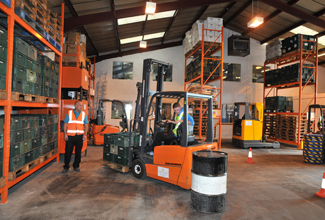 ELEMENT 7 requires you to carry out a practical lesson on a subject related to lift truck operations. This is to assess your ability on student participation, confirmation techniques, and basic instructional techniques. You are to assume that you are carrying out a five-day novice operator course. At the end of each lesson a critique will be given and any constructive points discussed and recorded on the course documentation. ELEMENT 8 requires you to construct a test area and conduct and mark a basic skills test to ITSSAR standards and complete the relevant paperwork. ELEMENT 9 requires you to write a report related to lift trucks i.e. a report on a student who has failed a course. Assessment on all the above elements will be carried out throughout the course. If any of the trainees are referred on any of the above elements, further assessments will be required until they pass that element. This can be done on the course given the availability of spare time within the programme or can be carried out at a later date. Each successful candidate is then registered as an ITSSAR Accredited Instructor and this accredited lasts for 5 years after which a refresher course is required.